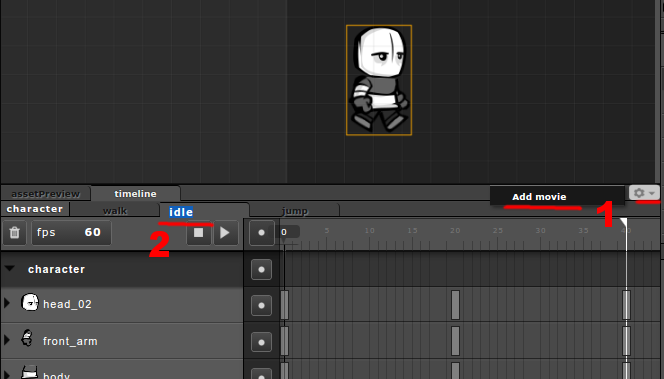 At first we will create 3 animations for character: walk, idle, jump. Check detailed graphical tutorial how to do it. Remember that you can create additional tween for your object group by clicking Settings -> Add Movie on top right part of timeline panel (nr.1 in picture). Rename movie by double clicking on active tab (nr.2 in picture). By default a new tween is called “NewMovie”. After that go to source editor and create character group. When character is ready you can add movies to it. Wow, very fast, you already made a tutorial after my posting in the forum. This surely will be helpful to all. BTW, I think I found a bug related to setting keyframes. They always get set for all items not only for the selected. I also made a little screen capture video, where I show this as well as some features / things that I’d found great to have. 3) Shape tool. Will consider, but this wouldn’t be priority for next 2 months. I’m glad it is helpful. I started to write about my issue with setting keyframes and then thought it might just be easier to show directly. Nice to hear you will take things into account. So setting keyframes then is very intuitive. I was using it just the way you said. Only I wasn’t aware it’s broken. Good to here it’ll be fixed.